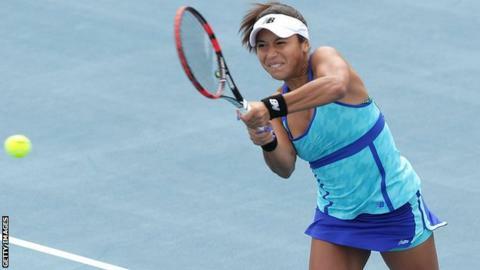 Heather Watson came through six rain delays - one of them at match point - to beat Alison Riske and reach the final of the Hobart International in Tasmania. The British number one prevailed 6-3 7-5 to move within one victory of her second WTA title. Watson, 22, will play American Madison Brengle in the final after she beat Japan's Kurumi Nara 6-4 1-6 6-3. "I'm very happy to finally get through today - it was tough," said Watson. With wind hampering play and rain repeatedly forcing the players off court, Watson won five games in a row to clinch the first set and fought back again to take charge of the second. Riske was thrown a lifeline with more rain arriving just as Watson earned a third match point on serve, and when play resumed over an hour later the Briton was clearly nervous. A double-fault on match point was followed by complaints over two line calls and the game was slipping away as Riske levelled at 5-5. The American had struggled with unforced errors throughout, however, and she allowed Watson to regain the initiative with another break. At the second time of asking, Watson closed out the match with a far more solid service game. "It's definitely not great conditions to play tennis and it was never going to be a very pretty match," added Watson. "I think the goal for Alison and me today was just to get the ball in and not go for free points." Asked about the rain delay at match point, Watson added: "It was the right decision. "I obviously wanted to play but the point before I slipped myself, so it was the right thing to do." Watson is trying to add the Hobart title to her first tournament win in Osaka two years ago. After Saturday's final she will head to Melbourne for the Australian Open, where she takes on Bulgaria's Tsvetana Pironkova in the first round on Monday or Tuesday.